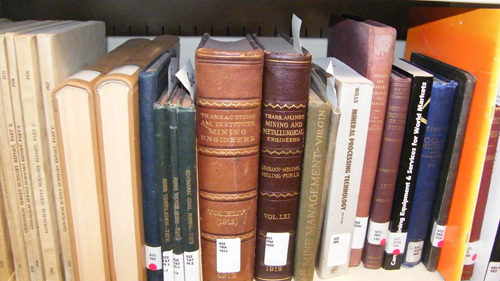 The Museum of Industry library contains over 2600 books relating to industrial, technological, labour and Nova Scotia history. Our holdings include local histories for many parts of Nova Scotia, general Canadian history, books on various engineering and mining topics, many of them old textbooks used by workers in those fields. There are also specialized periodicals, both old and current, resource materials and theses on microfilm and microfiche. As well, we keep vertical files of clippings and documents on various current technologies and industries here and elsewhere. A unique resource in our library is our collection of research reports we commissioned to provide information for our exhibits. Topics include mining, railway building, steel making and Nova Scotia’s economic and industrial history and several oral history projects. See the Research section for a complete list. Please note that it is a reference library only, our materials cannot be borrowed. Access to the library is by appointment. Please call the Museum and ask to speak to the Curator of Collections at least a few days before you would like to visit. We have very limited genealogical reference materials. The best places for Pictou County genealogical research are The Hector Centre and the New Glasgow Public Library. Also try Nova Scotia Genealogy Vital Statistics database.